Tiger Woods is a crocodile hunter! I bet you didn't know that. It's true -- he can do anything. Just take a look this belt. Tiger killed this crocodile with his bare hands and then made a belt with it. (Hang on a second, my editor is on the phone.) Okay, I'm being told that Tiger Woods did not kill a crocodile to make this belt. Please ignore my previous silly comments. 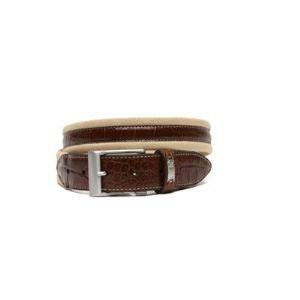 Although this belt has a crocodile overlay, it turns out it's all leather. It's from Tiger's snazzy clothing collection. This is a very stylish brown belt. This has the Nike patented G-Flex which makes the belt a little more flexible. Thus it has a little give in it when you are making that full turn while hitting your drive, or in my case making a full drive (to the concession stand) while hitting the turn. The coolest thing about the belt is the brushed finish buckle with the Tiger Woods logo on it. If you like this belt, you are going to love the Nike Golf Tiger Woods Men's Croco Leather Belt with Laser Etched Hardware. It's the same belt, but the buckle is laser etched with a polished gun metal finish and matching loop. Finally, it is clear now that Tiger has never harmed a crocodile. This belt is leather. Hey, did you know Tiger Woods is a bull fighter?